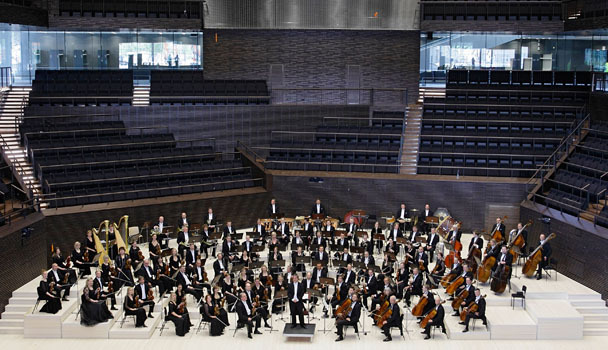 The Helsinki Philharmonic Orchestra, the first professional symphony orchestra to be founded in the Nordic coun-tries (1882), has been operating without a break for 130 years. During this time it has grown from a band of 36 play-ers to an orchestra of 102 regular members giving concerts attended by a total audience of a good 100,000 a year. The Chief Conductor of the HPO for the first 50 years was its founder, Robert Kajanus, and between 1892 and 1923 it gave the first performances of almost all the symphonic works by Jean Sibelius with the composer himself conduct-ing. Kajanus was succeeded by Paavo Berglund, Okko Kamu and other conductors of note. The 11th Chief Conductor of the HPO was Leif Segerstam 1995-2007, today its Emeritus Chief Conductor. Violinist-conductor John Storgårds began as Chief Conductor of the Helsinki Philharmonic Orchestra in autumn 2008. Estonian Olari Elts is the HPO's Principal Guests Conductor as of autumn 2011. As of autumn 2011 the newly constructed Helsinki Music Centre is now the very heart of Finland's musical life and the HPO's new home venue. In addition to the 70-80 concerts it gives each year in Helsinki the HPO regularly tours abroad. The first foreign visit was to the Paris World Exhibition in 1900. The Orchestra has visited most of the coun-tries in Europe and been on four tours both to the United States and Japan. In spring 2004 the HPO was the first Finnish symphony orchestra to tour South America and in August 2008 the HPO visited China for the first time. Works by Sibelius and Rautavaara have featured on the highly-acclaimed discs made by the HPO. In the mid-1980s Paavo Berglund conducted the Orchestra in a complete recording of the Sibelius symphonies. The Sibelius series under Leif Segerstam began with the Lemminkäinen Legends and Tapiola, followed by the violin concerto (sol. Pekka Kuusisto) and earned the Orchestra a Gold Disc. Ondine and the HPO completed a joint major project in 2005 with the last volume in a new recording of the complete Sibelius symphonies that has received excellent reviews in the international press. This symphony cycle was crowned by an 'original' Kullervo Symphony recording in collaboration with soprano Soile Isokoski, baritone Tommi Hakala, Finnish Male Choir YL and the HPO under the baton of Leif Segerstam. The record-ing won the Diapason d'Or 2008 Award in Paris in November 2008. The unique disc of solo songs by Sibelius with orchestral accompaniment, featuring soprano Soile Isokoski as the soloist and Leif Segerstam as the conductor, has likewise been highly acclaimed by leading music critics, and was awarded the MIDEM Classical Award 2007 in Cannes and the BBC Music Magazine's Disc of the Year Award in Lon-don in April 2007. The HPO recording Scene d'amore (2008) with Soile Isokoski and conductor Mikko Franck inter-preting the most beloved opera-arias has also been praised in the international media. The recordings of works by Einojuhani Rautavaara have been international successes. Angel of Light won the Cannes Classical Award and a Grammy nomination in 1997, Angels and Visitations the Cannes Classical Award the following year. The Rautavaara series has continued with On the Last Frontier (1999), an HPO commission, The Journey (2001), Garden of Spaces, which was coupled with the Cantus Arcticus and the clarinet concerto, Song of My Heart, featuring baritone Gabriel Suovanen as the soloist (2006), Manhattan Trilogy (2008) and Before the Icons/Tapestry of Life (2010) with Leif Segerstam. The latest Rautavaara CD Towards the Horizon and Incantations with John Storgårds, Truls Mork (cello) and Colin Currie (percussion) is a world premiere recording winning the Gramophone Award 2012. Another work in the Rautavaara series is the third piano concerto, Gift of Dreams, commissioned by the soloist, Vla-dimir Ashkenazy. The concert recording of Josef Suk's Asrael Symphony (2009) with Ashkenazy has been an interna-tional success, as well as the 2011 Berlioz-Paganini CD with David Aaron Carpenter (viola). The Orchestra has ventured out into new recording territories with premiere releases of highly-acclaimed works by two leading contemporary US composers, John Corigliano and Christopher Rouse, and recordings of Erich Wolfgang Korngold's Symphony in F sharp and Much Ado About Nothing (2012) with John Storgårds. The HPO has released its most recent, highly-acclaimed discs of Finnish music under its Chief Conductor John Storgårds. HPO cellist Samuli Peltonen is the magnificent soloist in the Cheremissian Fantasy by Uuno Klami on a CD made in 2009. Also on this disc are Klami's Kalevala Suite and orchestral Northern Lights fantasy. On the Jean Sibelius disc of September 2010 are the tone poems The Bard and The Wood Nymph, and the Violin Concerto, starring Frank Peter Zimmermann as the soloist. The 2011 disc by HPO presents contemporary Finnish music by Jukka Tiensuu and the 2013 discs music (II symphony & Kullervo) by Leevi Madetoja (1887-1947) and by Dmitri Shostakovich (The Execution of Stepan Razin & Zoya Suite).